HomepageBlogMy mother. My inspiration. Her home. Her furnishings. That said, through some wonderful gift and happenstance, I have been blessed with a fabulous mother. She’s a little bit Zsa Zsa Gabor, a little bit Scarlet O’Hara, and very much her own. It’s from her that I get my passion for decorating, creating a home, excellent food from the best ingredients, and complete focus on my extraordinary daughters. My mother was all of that. 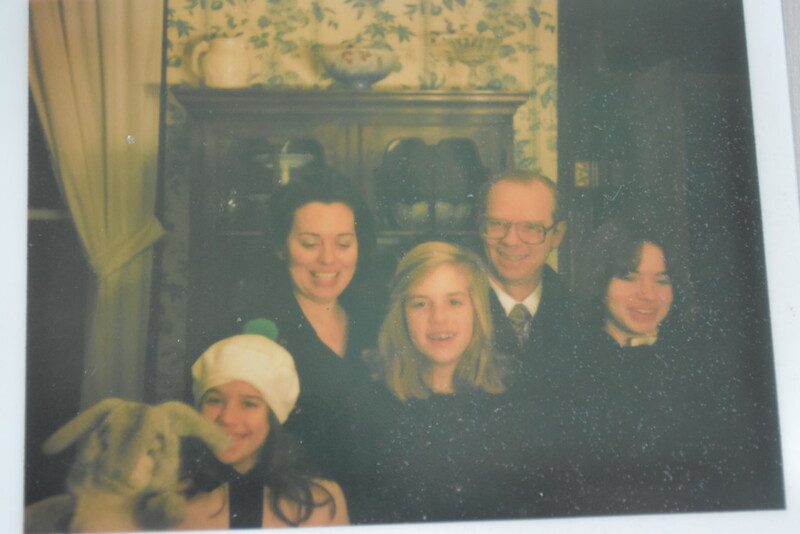 And raised four girls who, even as adults, are amazed by her energy, her enthusiasm, and her excellent taste. 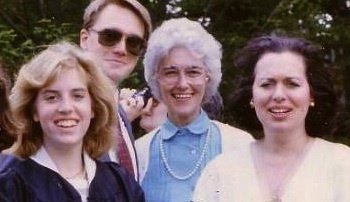 Hollins College graduation day 1985, with my mother, Sally Thomas (far right), my soon-to-be mother-in-law, Mary Frances Crum (middle). That’s Chip peaking through at the back, and me in my graduation gown. 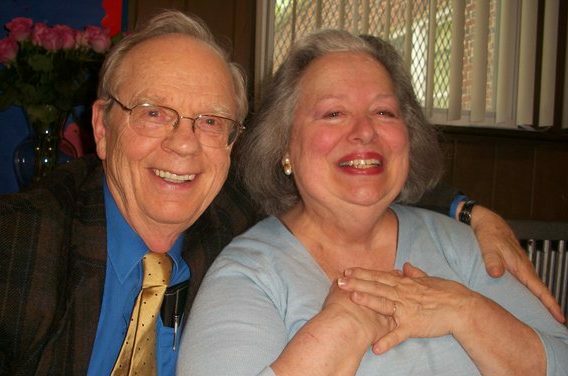 My mother, Sally Thomas, with my father, smiling her joyful smile. The charming approach to my parents’ home along a quiet mountain road. When my mother drove me up here, I knew the moment I saw this stone wall that I was going to love their new home. 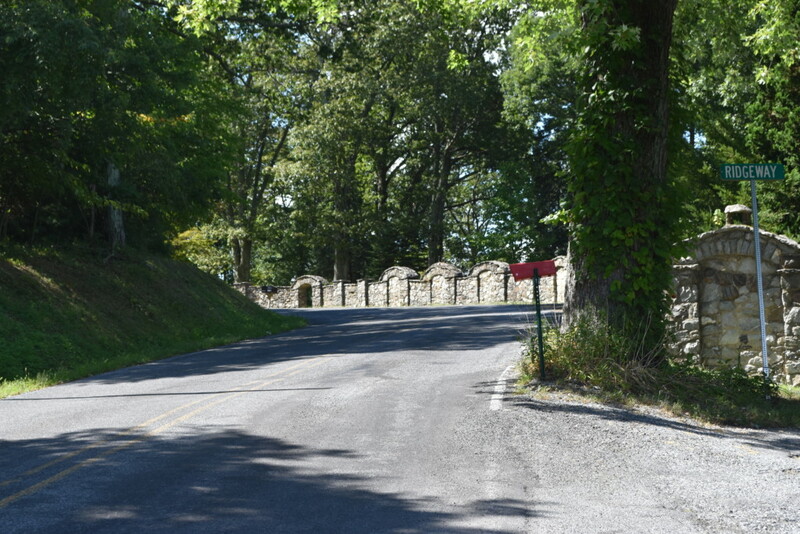 The stone entrance, with its original wrought iron gate. Even the little shed is pretty. 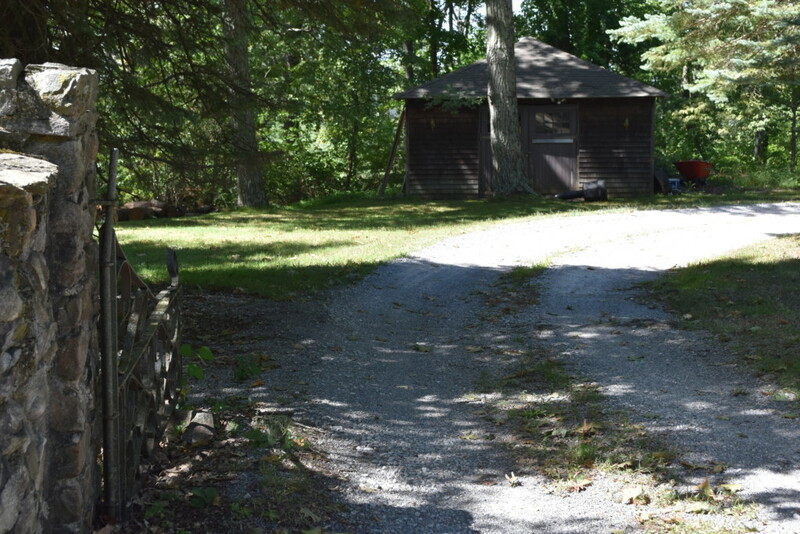 The drive curves off to the right, and this is the first glimpse you get of the house. 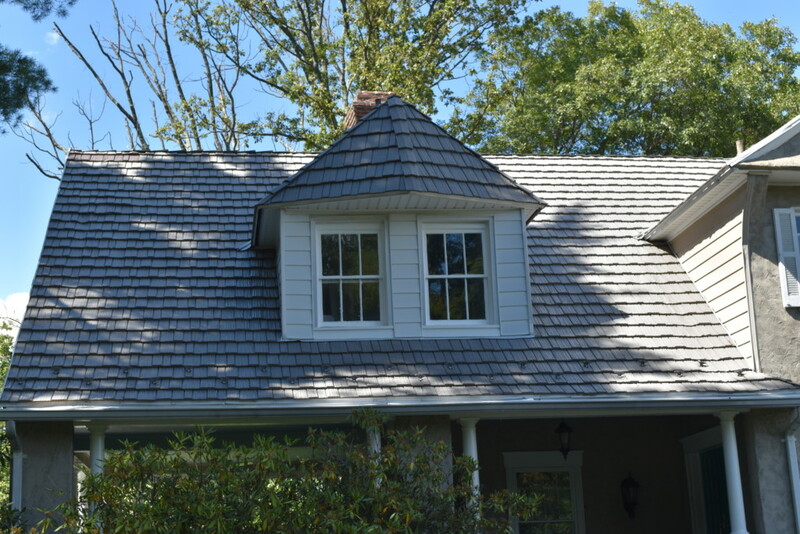 You approach the house from the side; this juliet window perched above the generous, wrap-around porch, is one of the first things you notice about it. The large porch, which I now realize I didn’t get a full photo of, is a full 12′ deep and wraps around this entire end of the house, with its dormered room above. This porch contains the main entrance to the house. The main part of the house continues beyond the front porch. The house is notable for its many gables and windows. 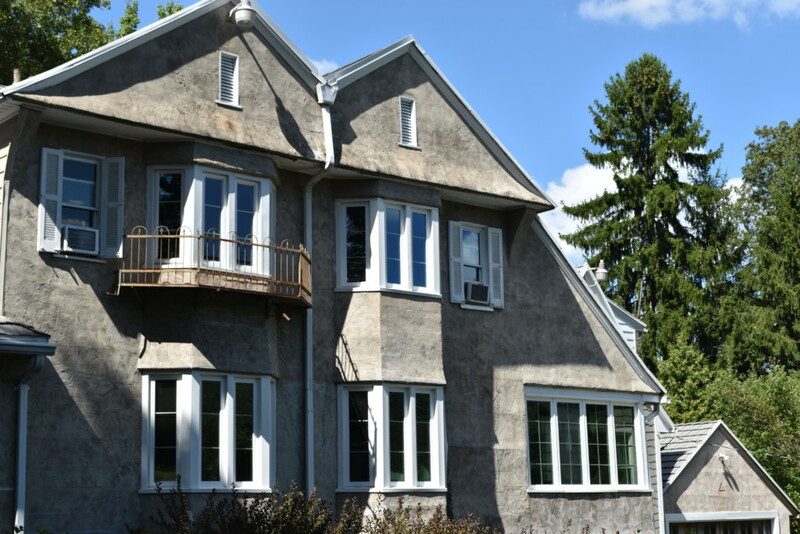 If you’ve ever been here to Chartreuse and asked about the diamond-paned windows we seem to have in abundance, this is the house from which they came. All of these windows were diamond-mullioned. It was truly spectacular, but very drafty. So we have the windows, and my parents spend much warmer winters. 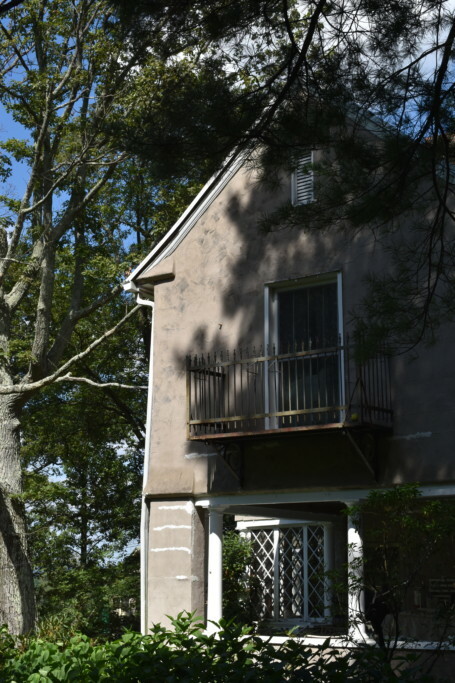 The far side of the house contains a 3-story apartment. 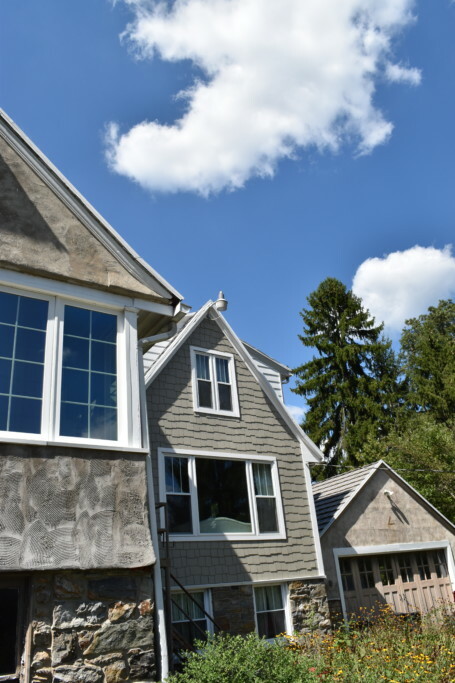 The picture window you see here is the main floor, below it (at ground level) is a bedroom and bath, and the third floor, with its pitched roof also contains a bedroom and bath. So here’s how it all goes together. The house, the apartment, the garage. It’s truly a house of many gables. 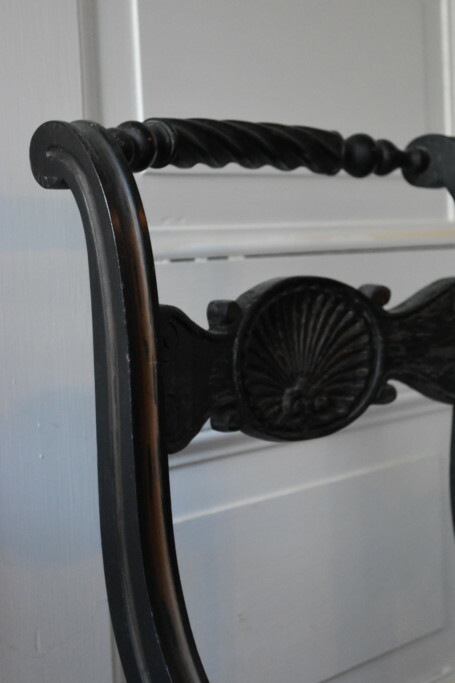 The house has a fascinating history. Built by an Anglican bishop, it became the summer resident of the Japanese ambassador until World War II. 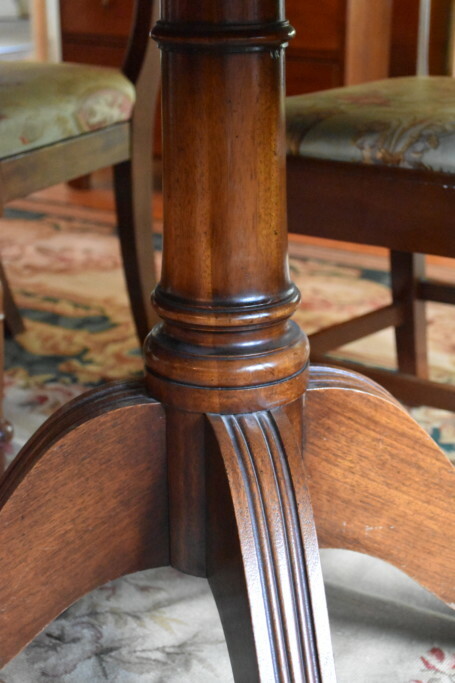 When my parent bought it 20 years ago, it had been a bed and breakfast for a number of years. 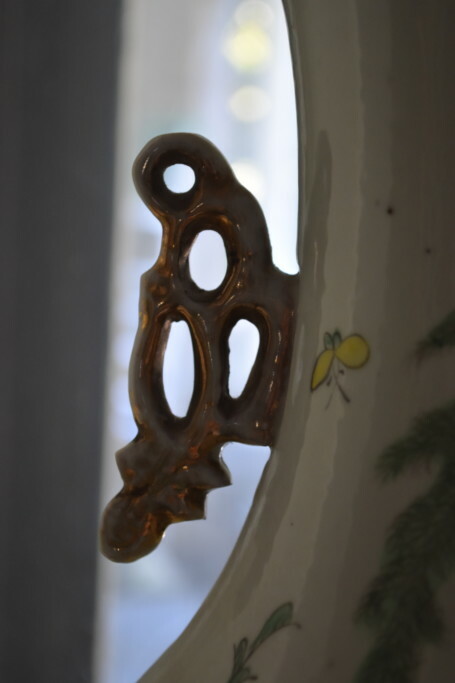 Let’s take a peak inside, and see some of the things they’ve filled their home with. 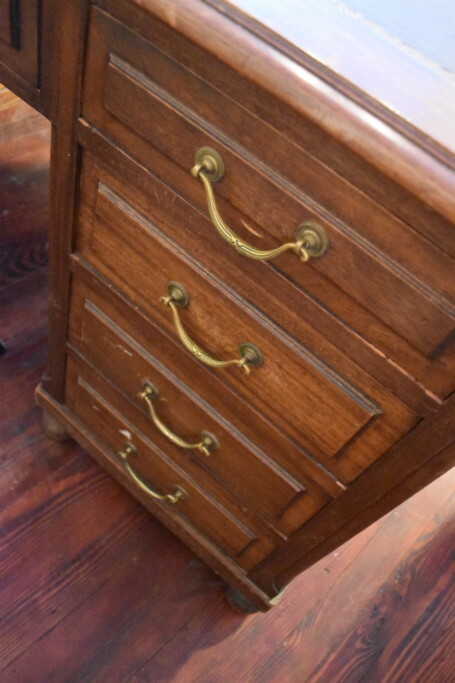 This stunning sideboard was purchased just for this spot in my parents’ dining room. 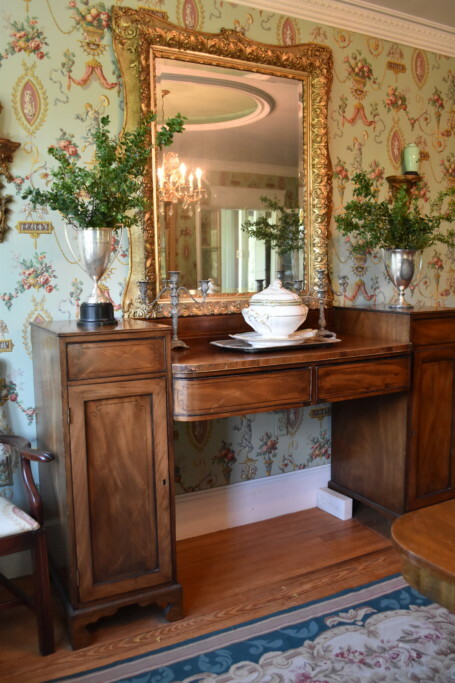 The gold mirror is one of my mother’s signature touches. 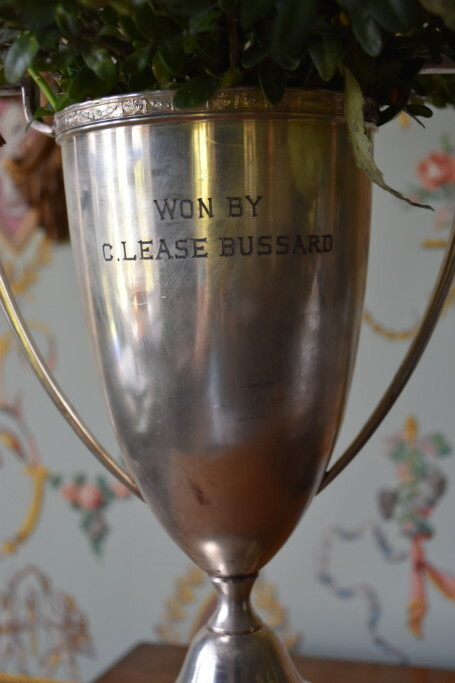 This silver loving cup was earned by my great-uncle Lease Bussard for tennis. He was a champion tennis player and is a member of the McDaniel College Sports Hall of Fame. 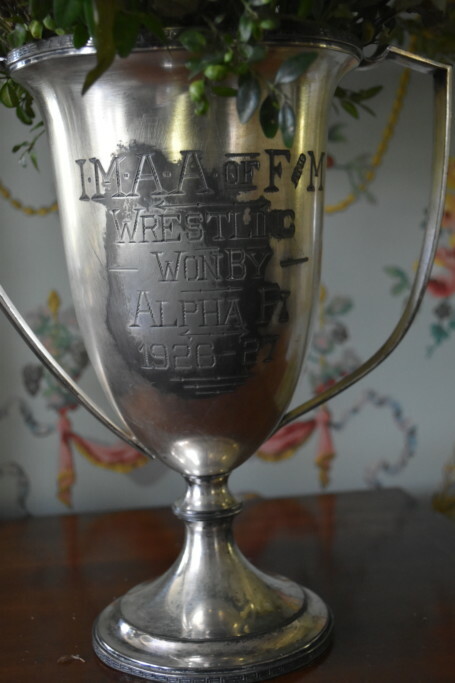 Not to be outdone by his brother-in-law, my grandfather won this loving cup trophy for wrestling while at Franklin & Marshall College. 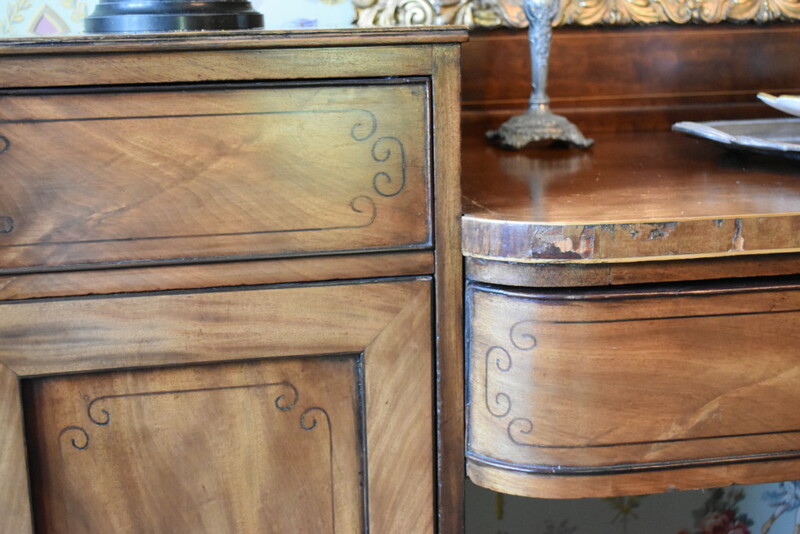 The scale of this sideboard is perfect, and these matching doors on either side create beautiful proportions. 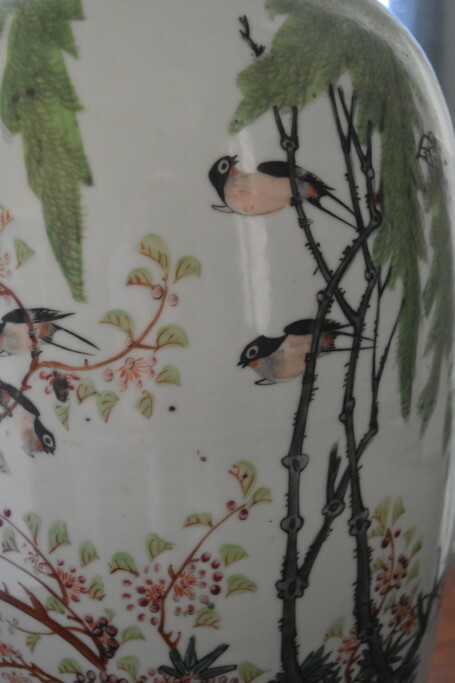 My father was posted in Korea in the early 1960s and brought a pair of these softly hued jars home with him. 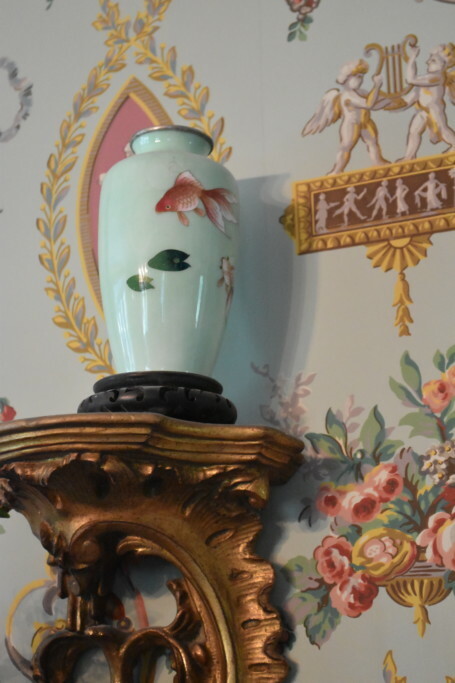 The colors are perfect for with the dramatic wallpaper my mother chose for the room, and these sweet golden sconces fit them perfectly. 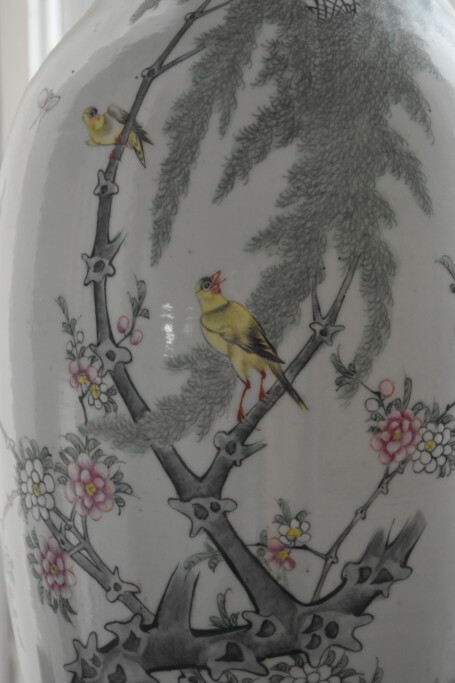 This spectacular Spode tureen was a present from my father to my mother many years ago. 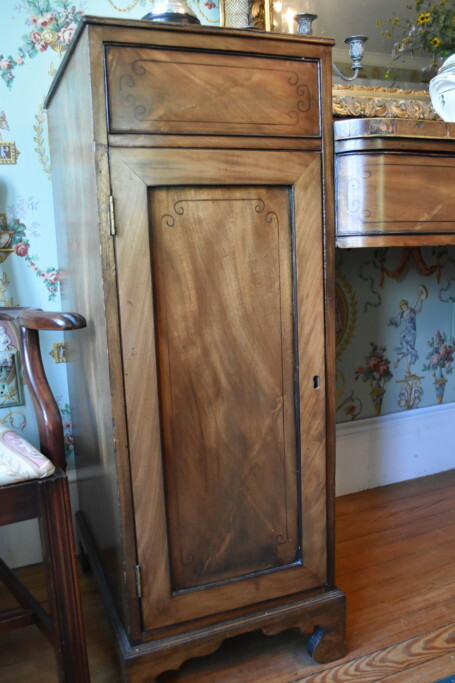 Its place has been here on this sideboard since they’ve been here, and with the sideboard going, the tureen must find a new home as well. The side board in all its glory. If you have something, use it. 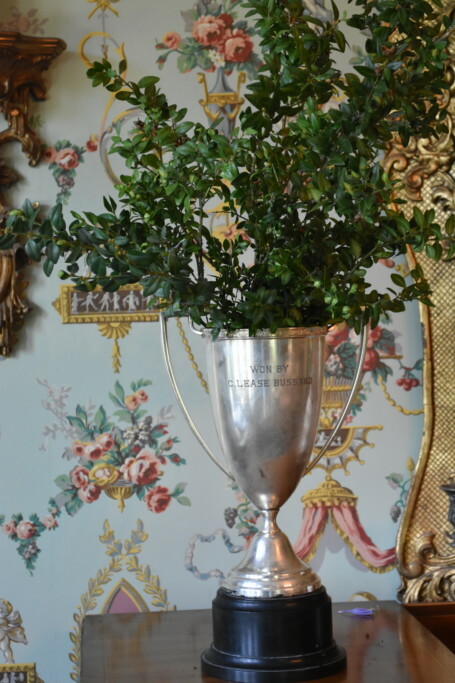 And these trophies have always made such spectacular vases – filled with greenery or flowers. 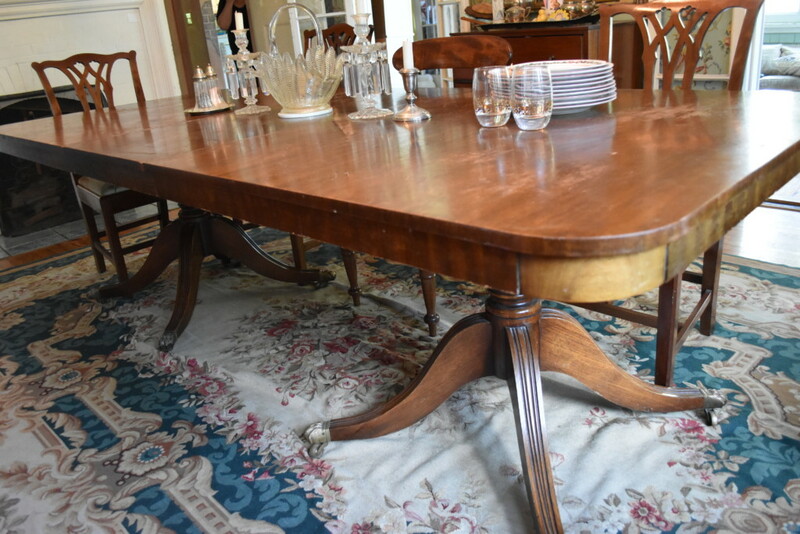 This beautiful mahogany dining table is from Belgium and comfortably seats 10. 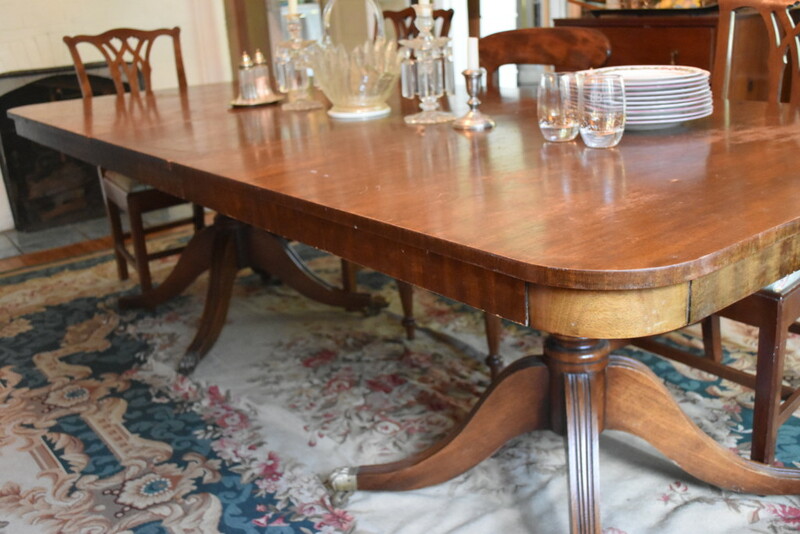 There’s a set of 8 simple chairs, also from Belgium, that go with the table. Let’s move from the dining room into the light-filled living room. 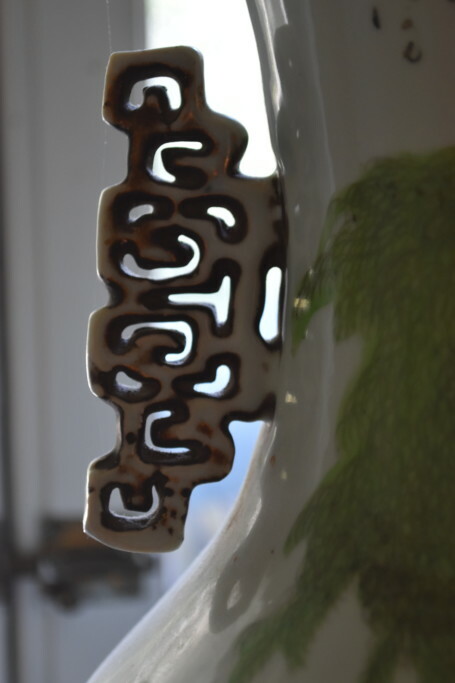 This exceptional piece of Roseville pottery [Ed. 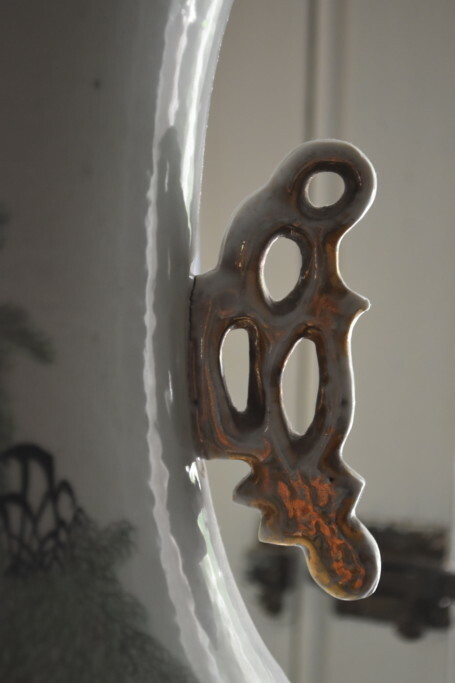 note: This piece is actually Weller Pottery (who did some Roseville work), circa late 19th/early 20th century Ardsley pattern, a classic example of Art Nouveau) is large enough to hold umbrellas. 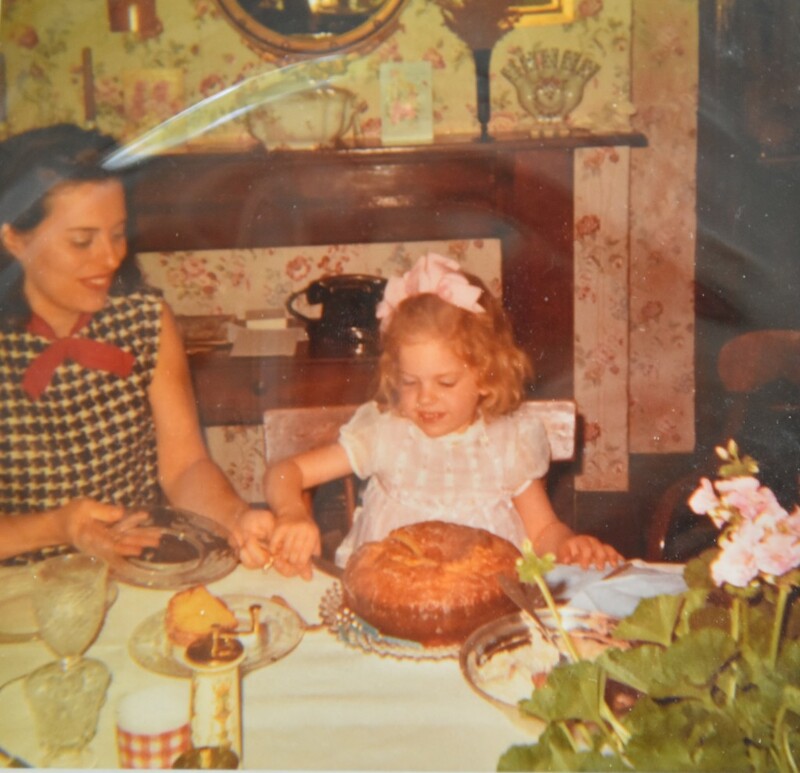 When I was a little girl, my Grandmother Smith and Aunt Barbara (my mother’s mother and sister) lived in New York City. It was always a treat to visit them. 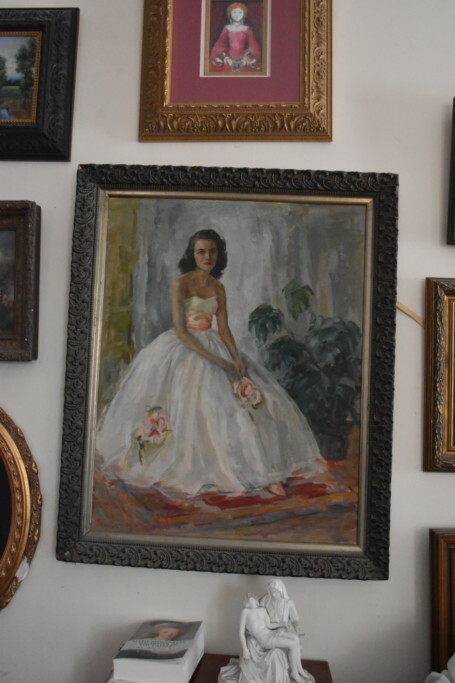 While there, my mother never missed the chance to visit Joseph’s Antiques on East 45th Street. 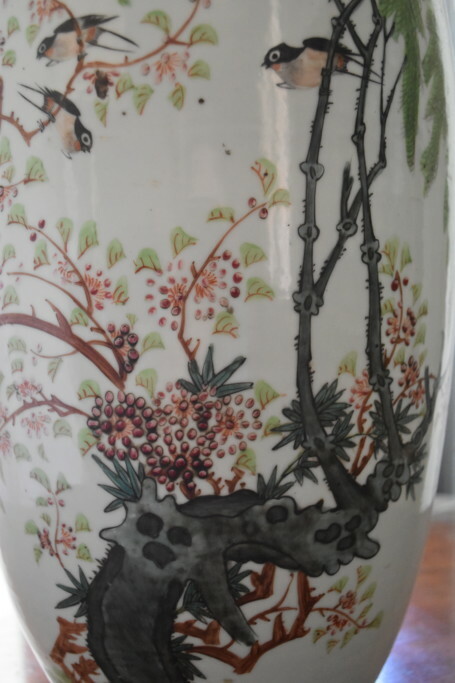 It was there that she found these Chinese urns, a pair of them – always a lucky stroke! The living room, which opens onto the large wrap-around porch, has a pair of french doors on either side of the central fireplace. 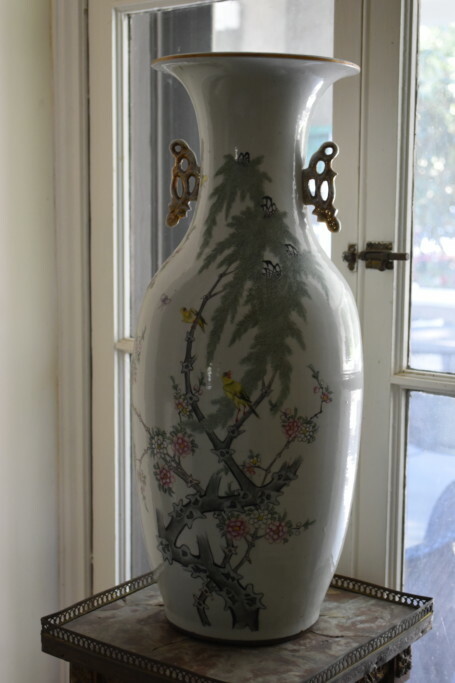 In front of each of these doors, these Chinese urns have been displayed. 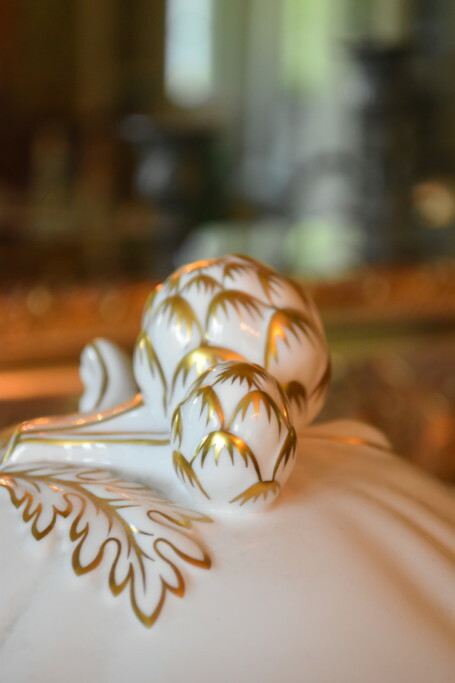 One of my favorite parts of these urns is their distinctively Chinese handles. 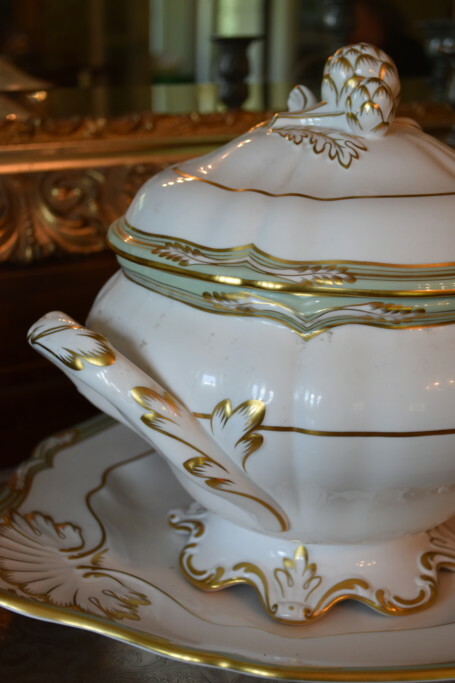 Though identical in size and shape, each of the two urns has its own, distinctive handles. 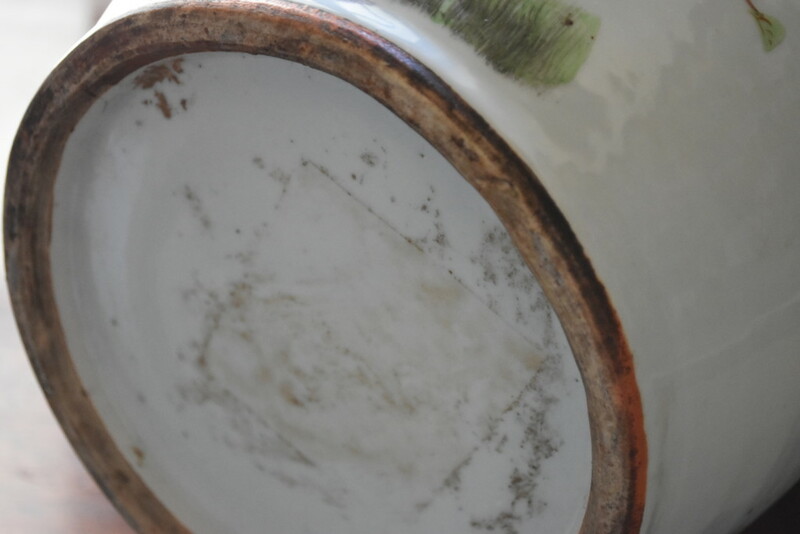 This second urn has a bolder image painted on it. You can see the difference, too, in the handles. 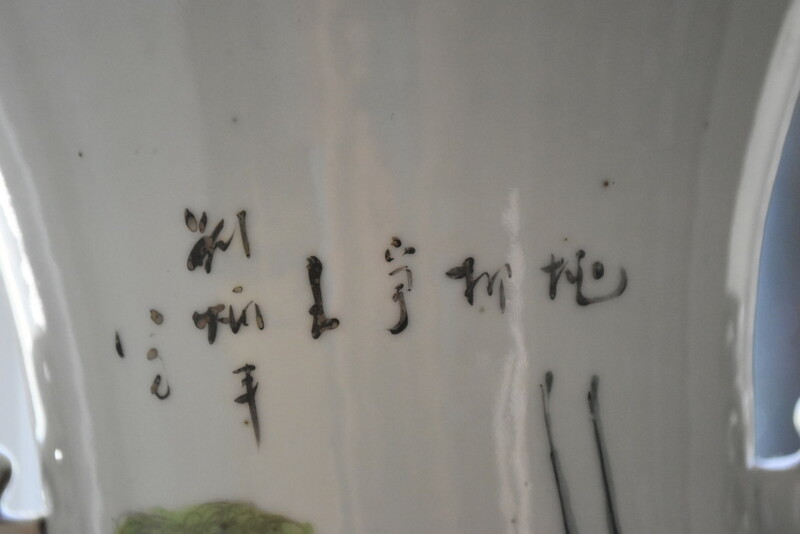 This second urn contains these small Chinese characters. I’ve no idea what it’s telling us, but I like it anyway. 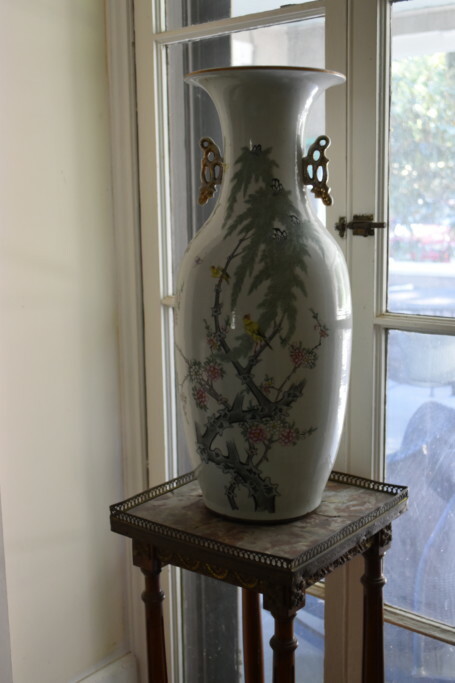 You can see how similar in theme, yet distinct in feel, the paintings are on these two urns. 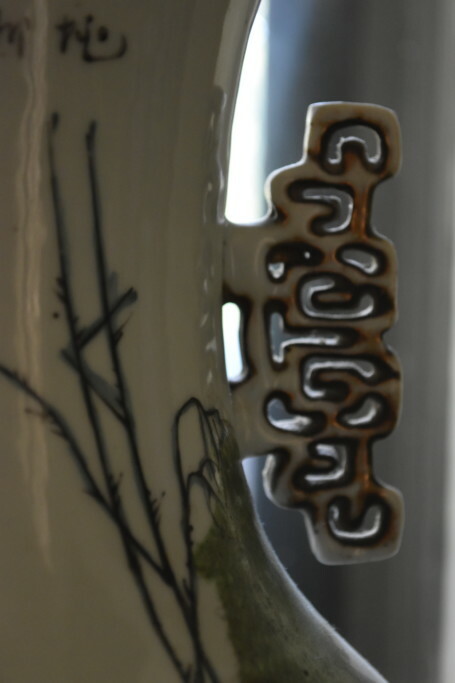 Here’s a detail of the base of one of the urns, so that you can see how they are made. 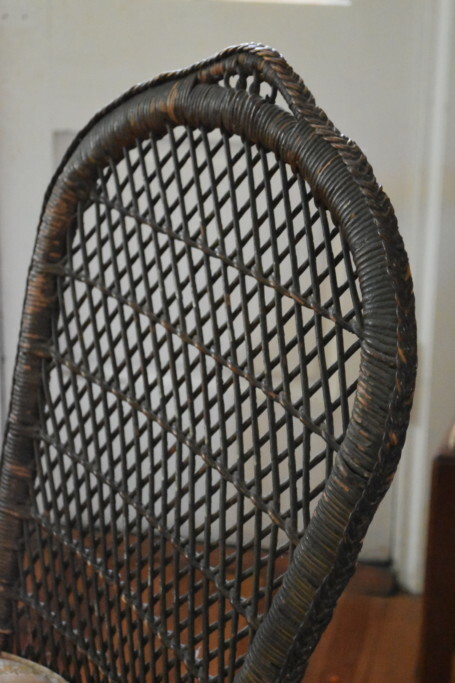 An exceptional late 19th century wicker side chair. 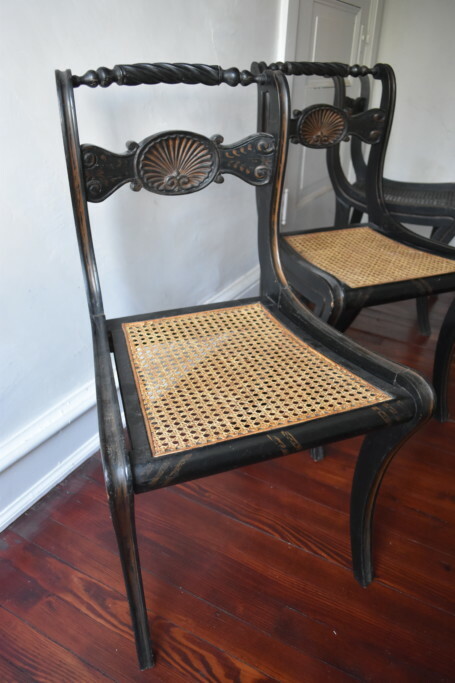 This nicely detailed chair once called Boscabel home (my mother’s family home). 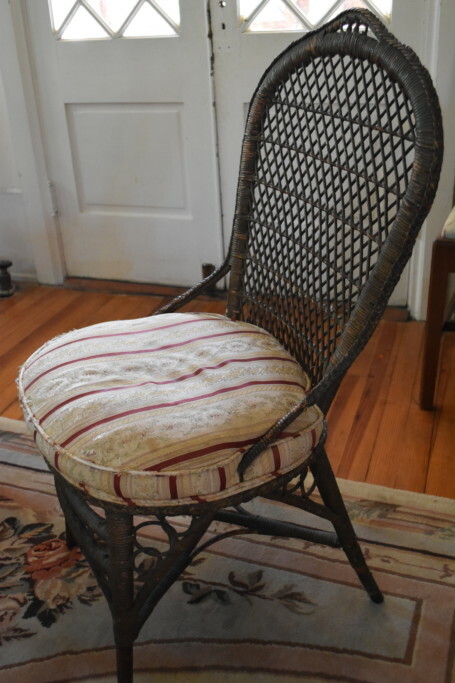 The chair has its original finish and wicker work, but my mother had it re-upholstered in a sublime, French silk stripe. 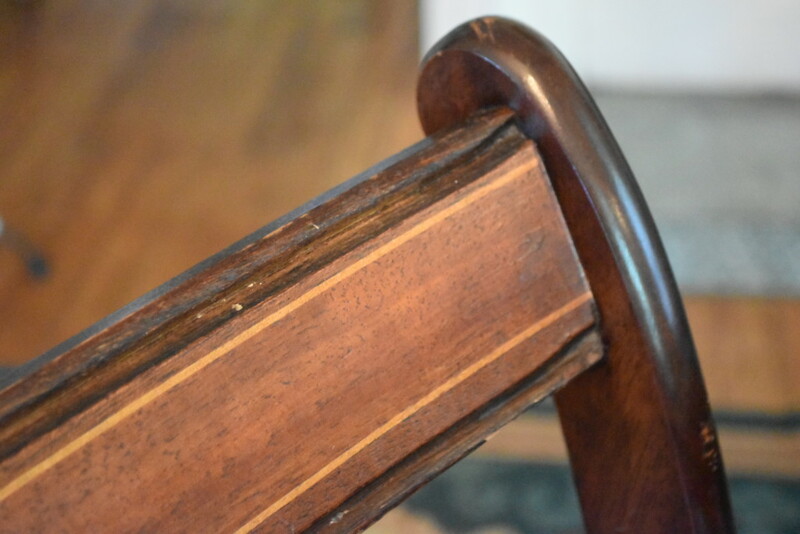 Here’s a look at some of the beautiful hand-done detailing on this chair. My mother does nothing by halves. 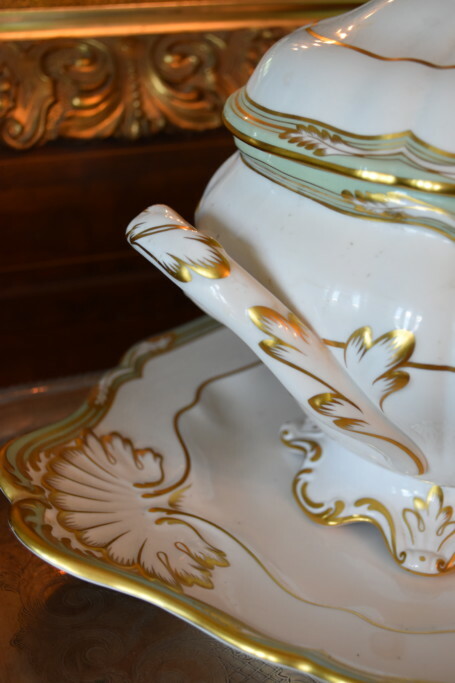 The French silk stripe she used is among the last of the fabric made in the French factory where Marie Antoinette had her textiles made. My mother acquired it in the fabric district of New York City. 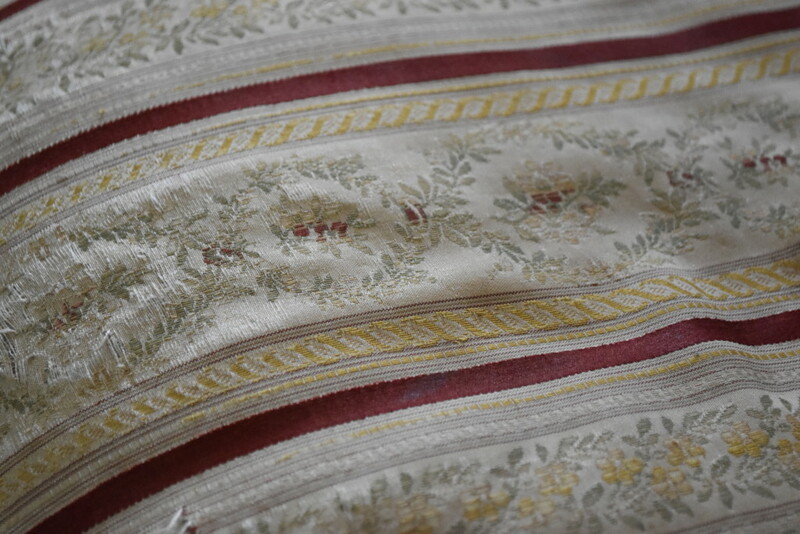 The distributor had purchased the remainder of the fabric when the French company closed. The bulk of this particular piece was purchased by Bonwit Teller, one of my favorite New York department stores (gone now), to create 18th century Mr. and Mrs. Claus costumes for their Christmas Open House, circa late 1960s. 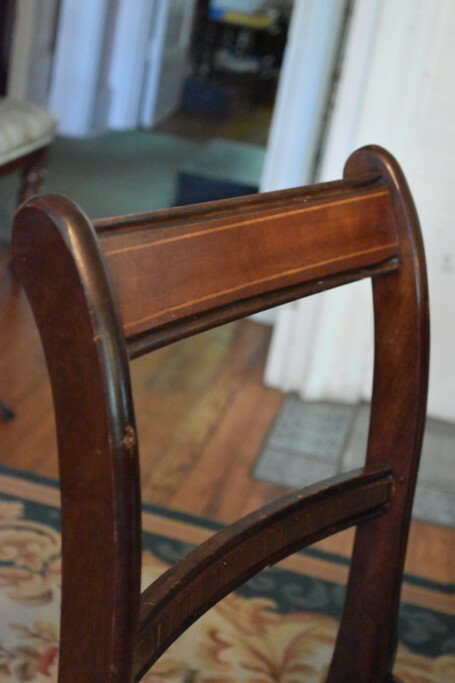 Further detail of the upholstery and the chair base. 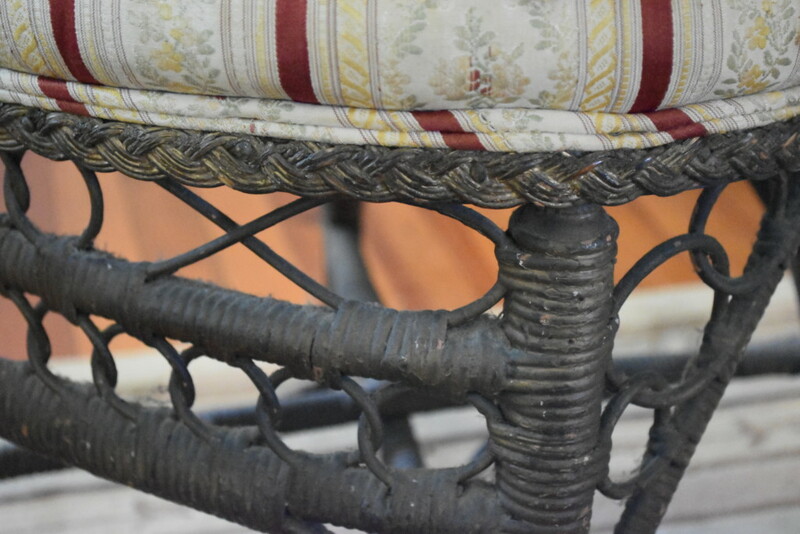 Detail of the wicker side chair‘s base and legs. Though the following paintings are not for sale, I wanted to share them with you as they depict some of the most influential women in my life. 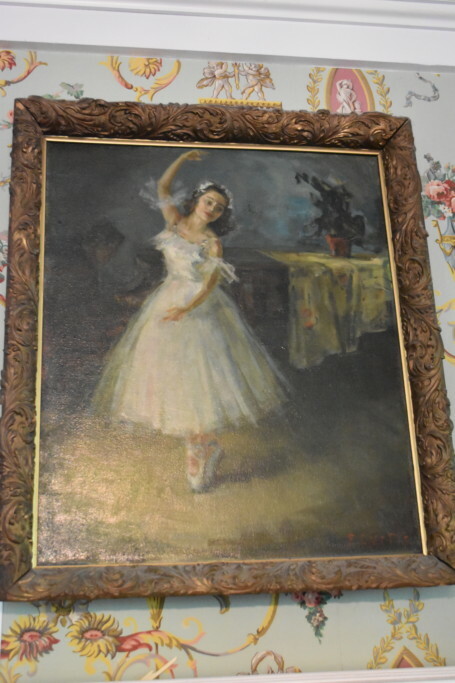 And it also gives you a sense of my mother’s love of art, which fills the walls of her home. 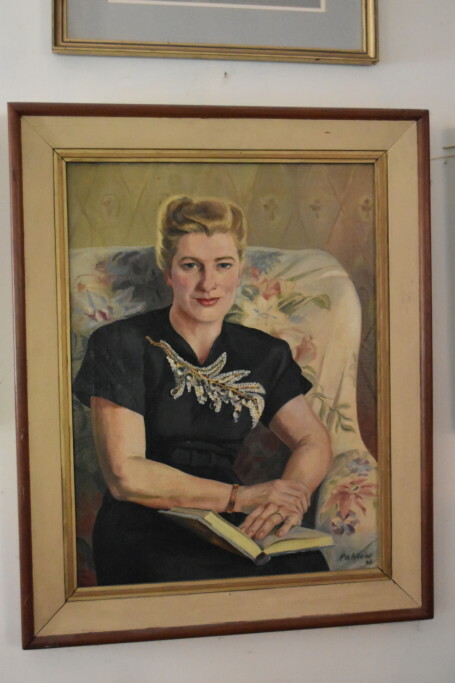 This portrait of my grandmother was done by Erich Pahlow, the German POW who painted the landscape of the farm that hangs in our glass room. It doesn’t really look very much like her, but as long as I was at Mother and Daddy’s I thought I’d shoot this picture for you to see. This elegant woman is my Aunt Barbara (you remember, the one who lived in New York City with my Grandmother Smith). She was my mother’s only sister and was 9 years her senior. 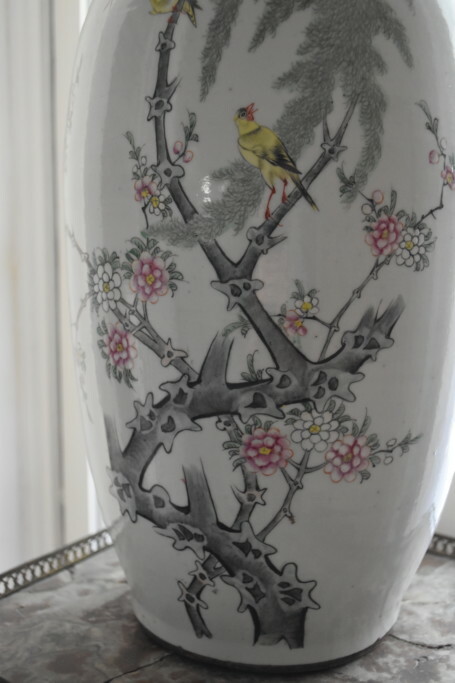 Aunt Barbara was a true renaissance woman: she painted, wrote, built things, designed things, including clothes. She LOVED clothes, and studied at Parson’s in New York. She designed and made the dress she’s wearing in the portrait. She was the glamorous aunt every little girl wants. 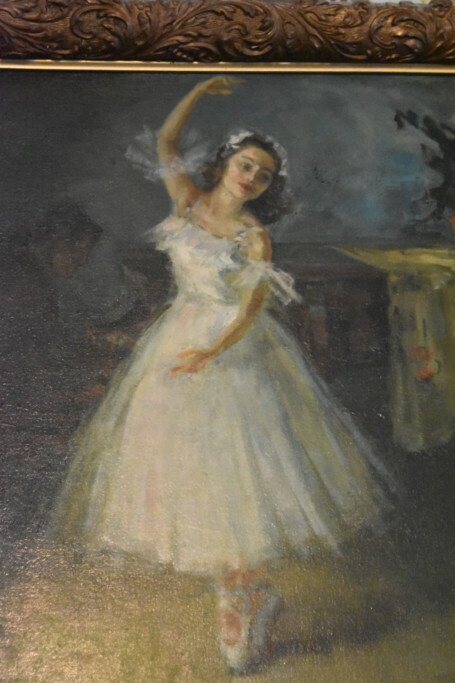 Here’s a better look at my ballerina mother. 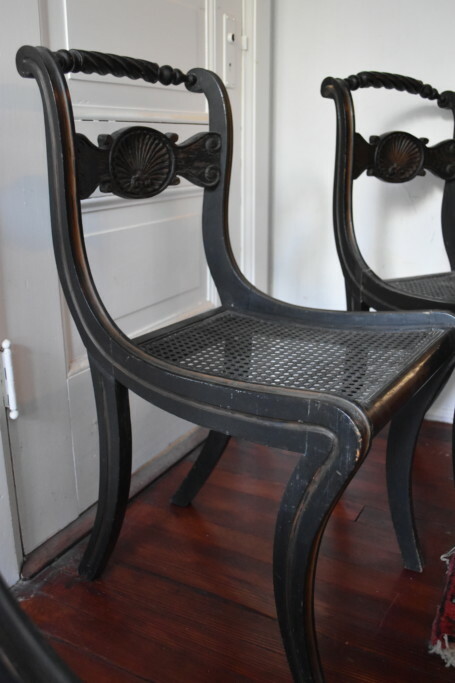 There are four of these exceptional American antique chairs. 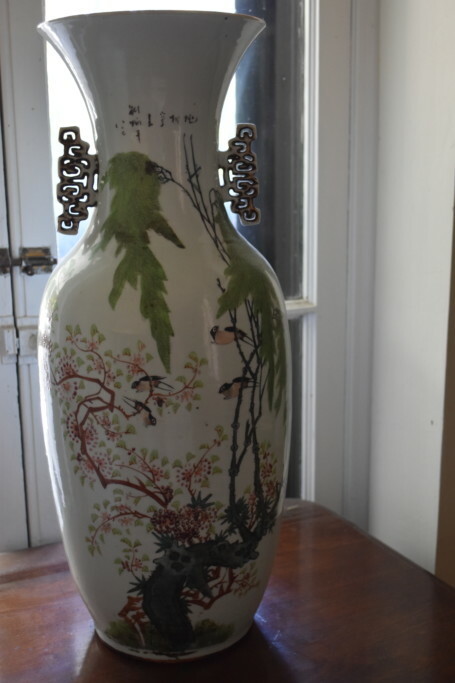 These, like the Chinese urns, are from Joseph in New York. The seats on two of them have been replaced, but the other two are original. 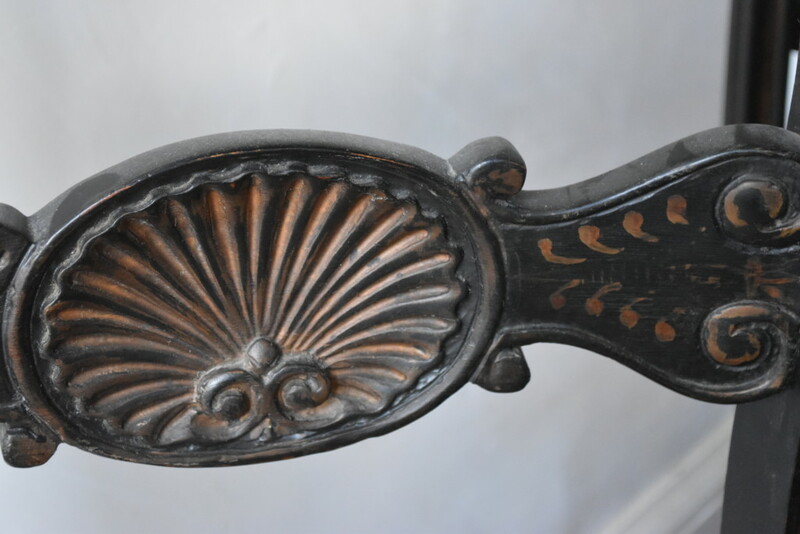 A detail of the hand-carved shell motif on the chairs. 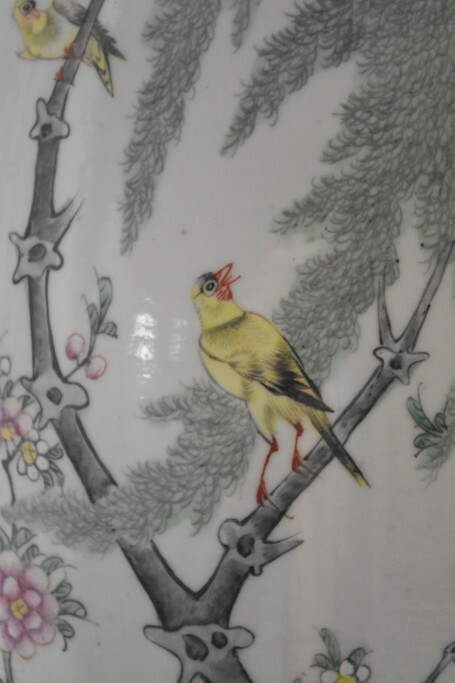 The delicate gold detailing is still very clear. 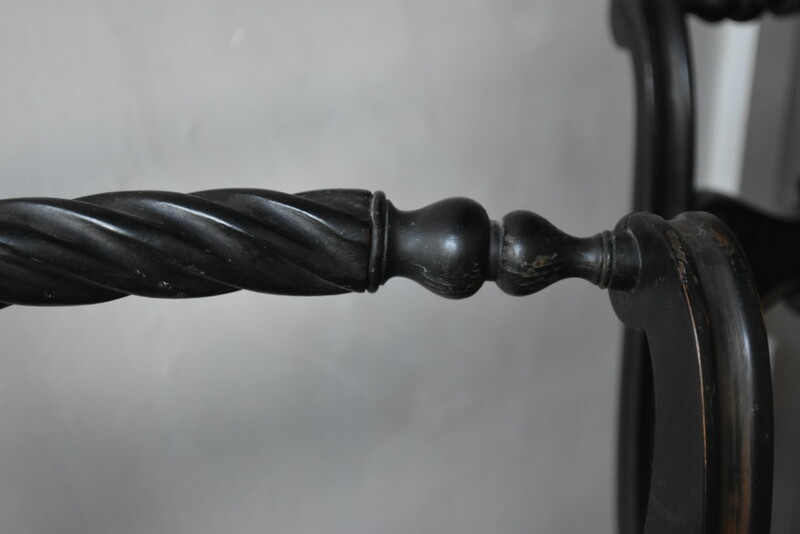 The top, back of each chair is this beautifully carved, sideways spindle. Just look at the soft curve of these backs. I mentioned in an earlier post that my great-grandfather founded Lilypons Water Gardens. That’s only partly true. He founded Three Springs Fisheries, growing millions of goldfish and selling them across the country. But in the 1970s when it came my father’s turn to take the helm, he found he didn’t really love the fish business, but was an avid water gardener. He loves water lilies. 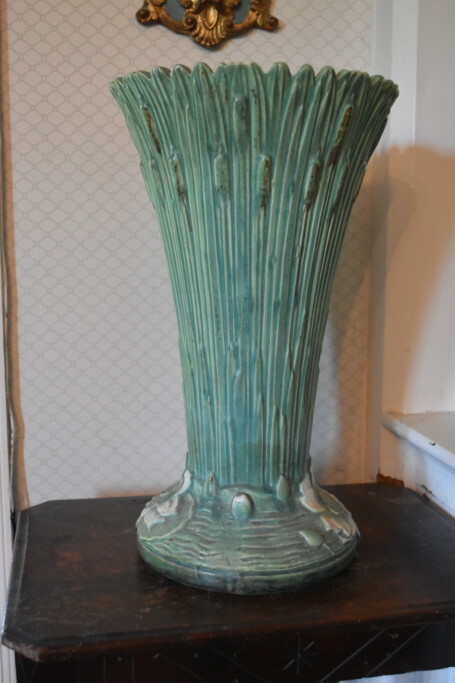 So he took his inspiration from the name of the town and road on which the business stood, and renamed it Lilypons Water Gardens, with a complete focus on creating water features and gardens in backyards throughout America. 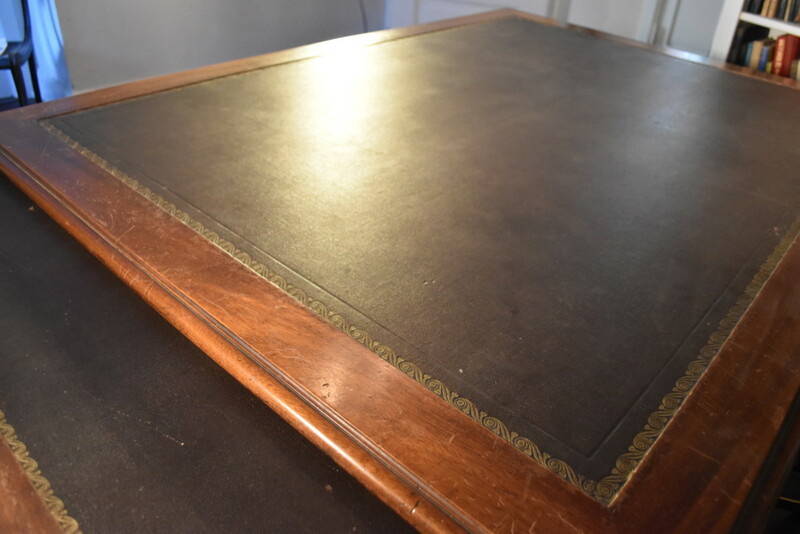 It was from this desk that he directed the national catalog business, the International Water Lily Society (which he founded), and wrote countless books and articles on the subject. 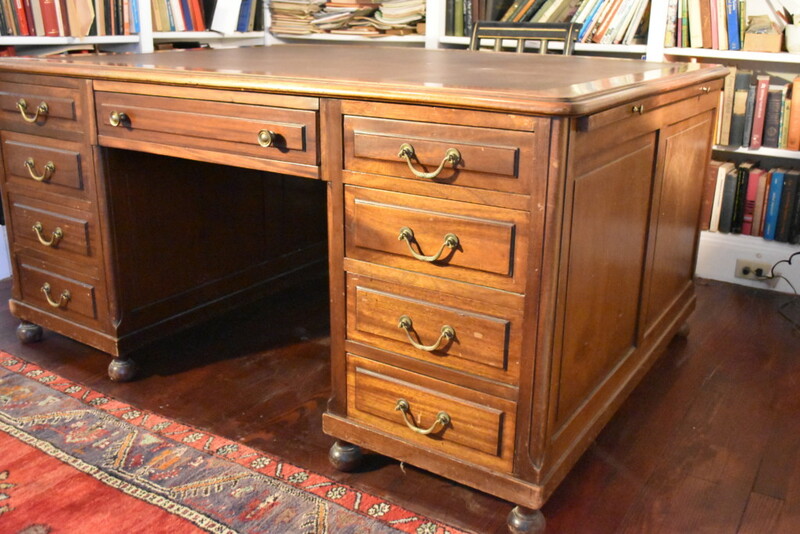 This late 19th century partner’s desk, hewn from solid mahogany, boasts 16 brass-pull adorned drawers (eight for each partner). The expansive 5’x7′ surface of the desk provided ample space of the pair of English partners who first used it. Look closely, and you’ll see that this immense surface is created from one piece of wood. There are no seams. 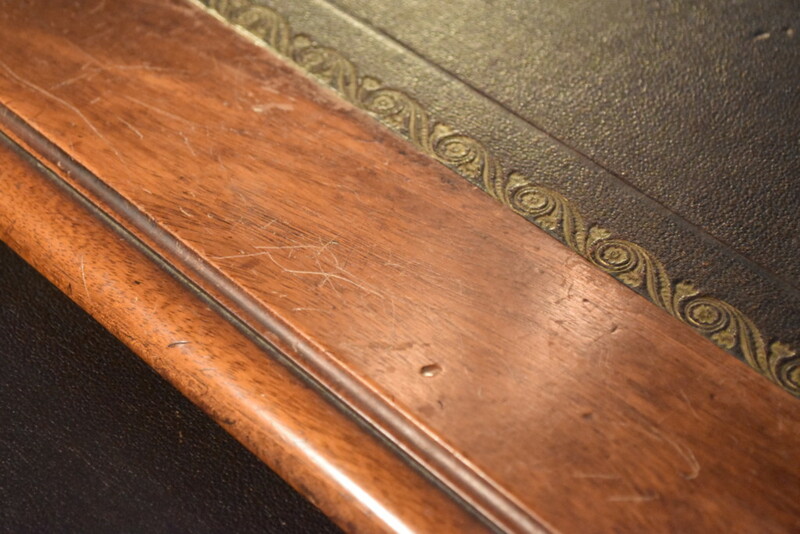 Even the edge of the surface of the desk has a bit of craftsmanship detailing. In the past 50 years my parents have lived in 4 houses, each of which they renovated before moving in. 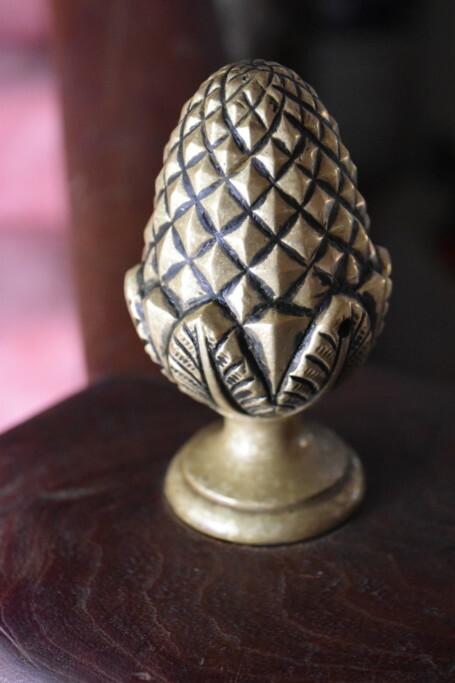 Every one of those houses has had this brass pineapple ornament sit atop the front staircase’s newel post. As I was coming downstairs it struck me – one of those things you stop seeing or just take for granted. 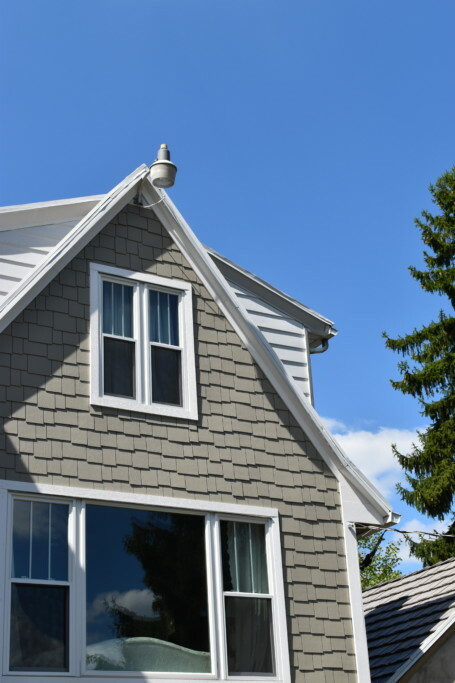 But as they consider down-sizing, and I start to really look hard at details, I was struck by this quiet, constant sentinel of the Thomas Family homes. 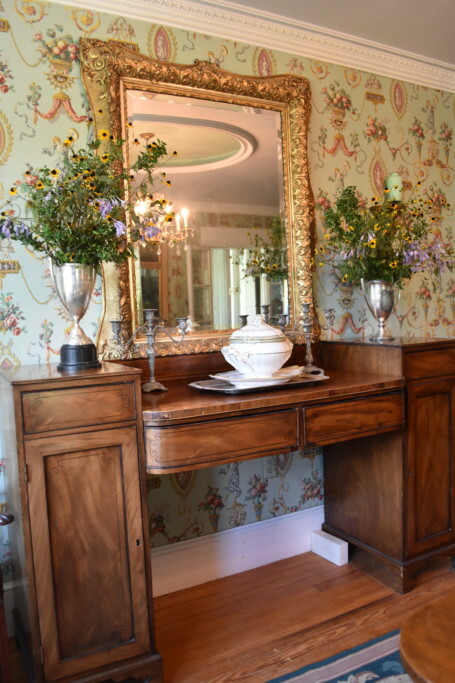 In all of the pictures you’ve seen of our dining room here at Clifton, from my grandmother’s tenure, you’ve seen fresh flowers on the table. But between Sunday evening dinners, the table was bare. 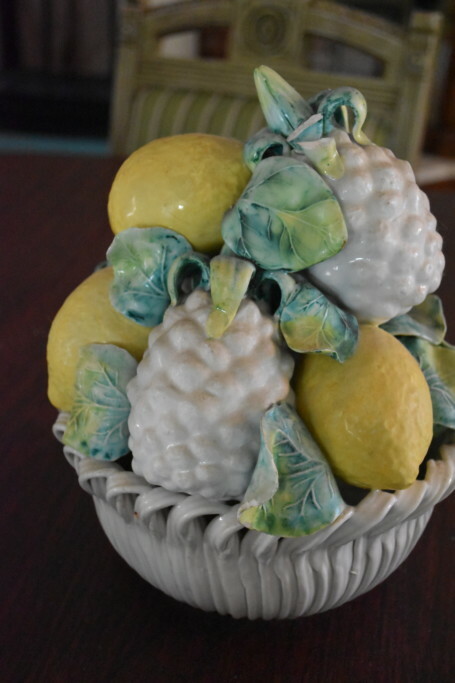 And this happy porcelain bowl of fruit was its soul ornament. 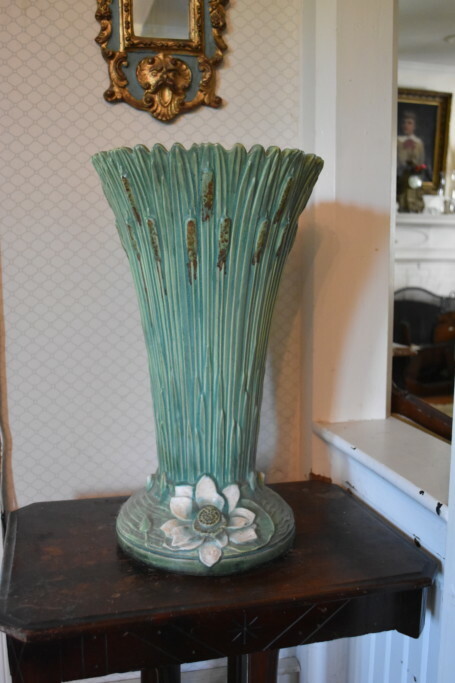 Grandmother loved this piece, a gift from my parents, procured from Saks Fifth Avenue in the early 1970s. So there’s a glimpse into the private home of my parents. I hope you enjoyed the tour. You can check out all of the items available for sale at our online store. Just search “Buena Vista” for the listings. Saturday, September 10 – I’m taking the week off! Chip and I are heading to the shore (and Hurricane Hermine!) this week, but I’ll return with a roar, because . . .
Saturday, September 17 – Fall Market Days! They actually begin Friday, September 16. You don’t want to miss them! Details on the website and hundreds of advance photos will be on Facebook. Saturday, September 24 – The long-awaited Kitchen. The last installment (for now) of the (re)Defining Home series. 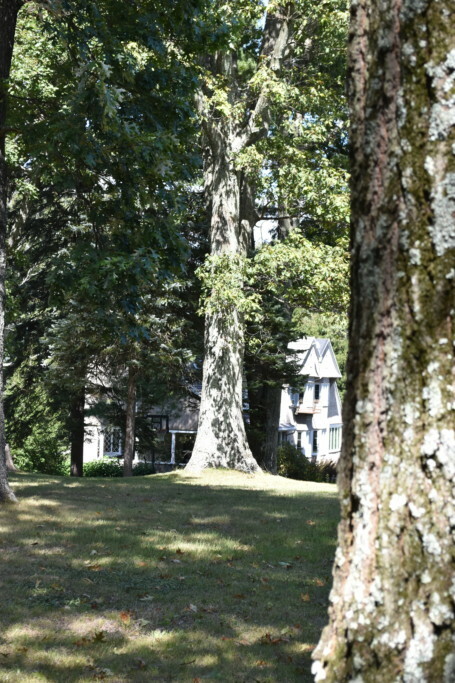 Your parents’ house looks like the area I grew up at up by Blue Ridge Summit going down to Waynesboro PA. I miss it so it’s beautiful! It is a beautiful part of the country. And so quiet. Frederick County, MD has gotten so busy they can’t believe it’s the same place they grew up in anymore. I need to know your source for that wonderful wallpaper? It’s pretty spectacular! 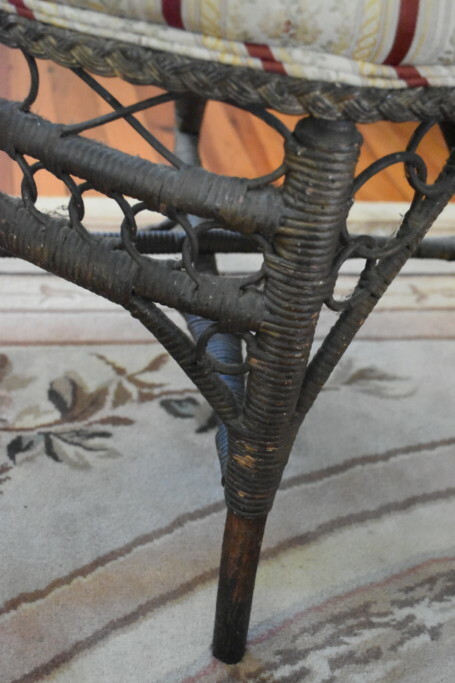 It’s available in fabric, too, and my mother re-covered her stunning caned, down-filled, English living room furniture in the fabric. Stunning effect. I’ll find out from my mother what it is. Happy hunting! It’ll look fabulous wherever you decide to use it. Simply enchanting!!! Thank you for sharing your parents magical home with us Virginia! I came across your blog via Facebook. I friend is attending your event this weekend. As soon as I saw the picture of your parents house, I knew immediately the house! This house was built in 1897 by George K. McGaw. He is my husband’s Great-Great Grandfather. Mr. McGaw owned a grocery in Baltimore, MD called Hopper-McGaw. He and two other gentleman started the Buena Vista Hotel Company. They built the hotel at the top of the hill. Mr. McGaw built this house, named Ben Rathan, for himself. He also built 3 more houses, one for each of his two daughters and one for rental income. These houses are down the lane from the Chapel. 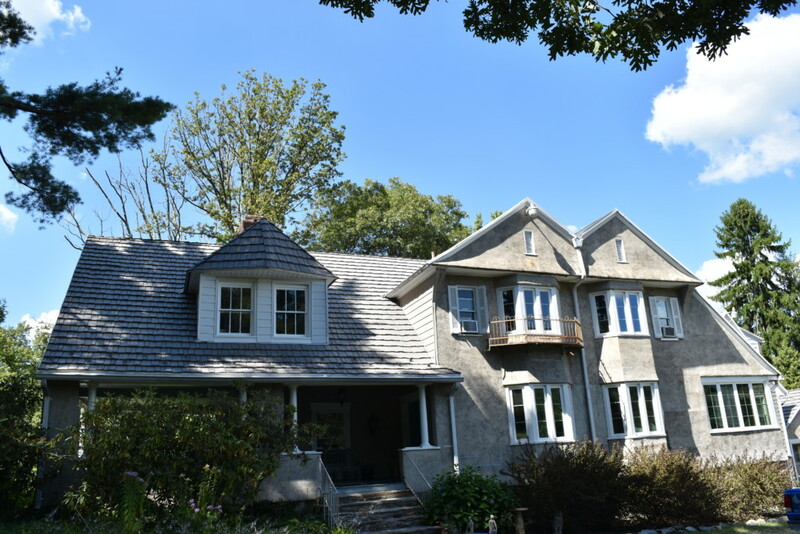 The first one is Edgemont, which is now white and owned by the Peiffers. It was the rental house. 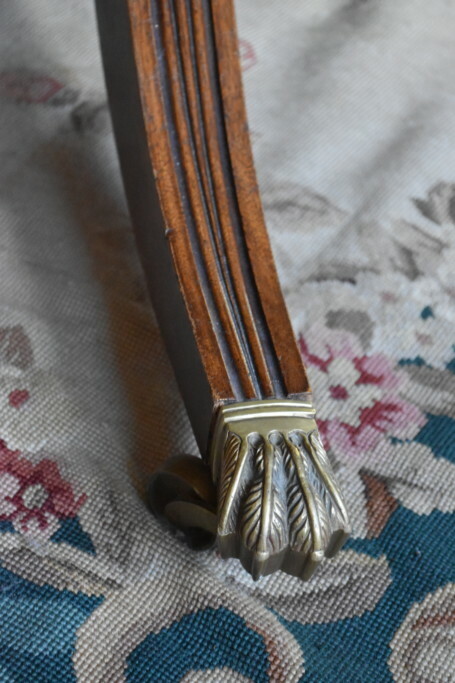 The second one, called Middlewood, belonged to Mary McGaw originally and now is owned by my husband and myself. The third one down the lane originally belonged to Sophie McGaw Miller, by husbands Great grandmother. It is now bricked and is owned by the Palaces. I was just excited to come across this blog. Wow! What a small world! Thanks for the detailed history. My parents told me that I didn’t have the origins of the house just right, so thanks so much for clarifying the details!